The W700 car-top boat featuring in these two videos is outfitted with a Wavewalk® TMM 700 HD motor mount and a 6hp Tohatsu outboard motor. The new Wavewalk® 700 Joystick Steering System can be attached to the boat within seconds, and detached as quickly when you want it out of your way, such as when you fish. You just store it in the hulls, and re-attach it whenever you want. It’s intuitive, comfortable, and easy to use both in the seated and standing positions. 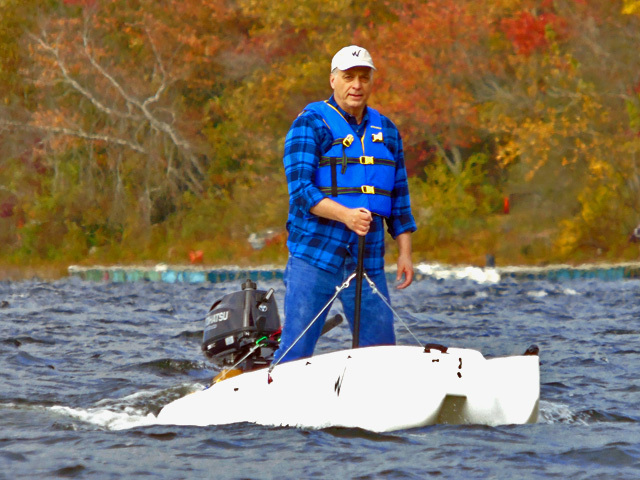 Steering with this system is more ergonomic than steering with a tiller extension, or with your left arm stretched behind you and your hand holding the tiller, as many small motorboats, jon boats, microskiffs and motorized dinghies are steered. This joystick system improves both turning and tracking in rough water, and makes steering easy in long drives. It works both when you’re alone in the boat and with a passenger on board. When you drive standing up, the joystick serves as a physical reference point that helps you balance yourself. Controlling the motor’s RPM is done through the throttle grip on its tiller. This is not a problem since the tiller is right behind the driver, and it’s easy to grab instantly when needed. Generally, there is no need for frequent throttle adjustments while driving a boat. The Joystick’s base is simply inserted in one of the saddle’s vertical holes, and the plastic coated steel cables are attached to the joystick, boat, and motor by means of carabiners. Shipping: $30 to addresses in the contiguous US, and $40 to addresses in Canada. Detail: Joystick Steering Handle, Jointed Articulation, and Plug-In Base. During normal usage there is no installation required, since the base of the joystick simply plugs into the hole in the saddle, the cables are attached to the joystick by key chain clips, and the pulleys are attached to the boat and to the motor with carabiners. It takes less than a minute to attach the joystick and have it ready for use. However, outboard motors are different from each other, which is why you’d need to adjust your joystick system to fit your motor, before you can start using it regularly. That the cables are inserted properly in the pulleys so they can slide back or forth freely. That the joystick is centered and moves freely in all directions, without being either too loose or too tight for your liking. To make adjustments to a cable’s length use the wire clips on it. That all the cables’ wire clips are tight. The best way to perform this initial adjustment is while you’re seated in your place inside the boat, with the outboard motor attached to it and its propeller lowered. 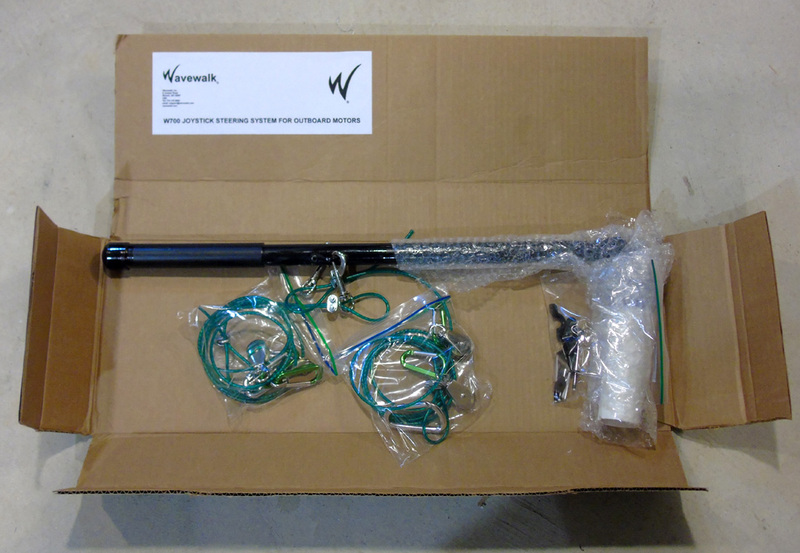 There is no need to have the motor running when you perform this initial setup, but we recommend that once you’re done, take some time to check your setup in the real world, and get used to driving your W700. Do this on flat water that’s deep enough for your motor to run safely without the propeller hitting the bottom. Remember – a motorized boat drafts several inches more than a human-powered one. Every few weeks, check that the cables’ wire clips are still tight, and grease the pulleys with lubricating oil, or with heavier grease if you drive in saltwater. Well greased pulleys will make driving more smooth. For greasing the outboard motor’s propeller shaft, please refer to the motor’s owner’s manual. I think I’ll continue letting my fishing rod be my joy stick, Yoav. That 6 hp outboard lowered the rear end a bit, but the 700 still performed well in that chop. I might prefer a 3 or 4 hp motor. Take a second look: The stern is low when I bump into a succession of waves, because that makes the bow rise, but the boat is nearly level when I drive in parallel to them. What this joystick did was get rid of my concerns about using a 6hp outboard, which is something that you have in the back of your mind when your hand is constantly on the throttle grip, whether directly or by means of a tiller extension. When you use this joystick, once you set the throttle and leave it alone, you no longer have to think about the RPM accidentally getting too high. Having said that, 6hp is overkill for such a small and lightweight craft, and 3.5hp would suffice for all matter and purpose. you yourself is beyond belief. 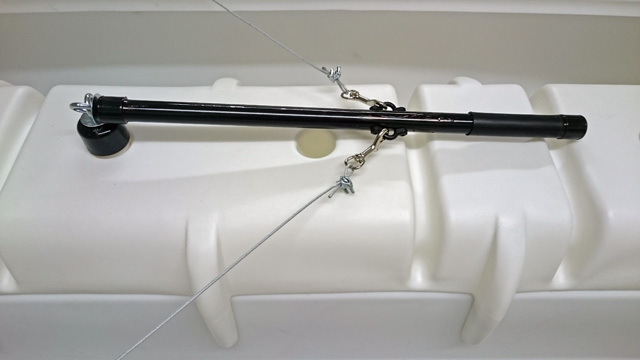 foot control steering, rod holders, storage ideas, then the Outboard Motors…….. I think you should write a book, The Dream, Walking on Water. Yoav, you have done it all. Yoav, Kayak Designer of the YEAR!!! Again, I tip my hat to you and your wonderful Wave Walk Kayaks. Could you make a video of the joy stick, from install, to taking it apart? I want one of these bad boyzzzzzzzzzzzzzzzzzzzzzzzzz! “Install” and “taking apart” makes it sound as if there’s really something special you need to do with this joystick system, but reality is that you simply stick the joystick base in one of the six holes that the W700 saddle features, and you snap a couple of carabiners to the eyelets on each side of the cockpit, and a couple carabiners to the outboard’s carry handle, et voilà! -It takes literally a few seconds, and no tools are required. If you’re sitting in the cockpit and fishing, and you want to get the joystick out of your way, you just remove the swivel hook from one side, lift the joystick out of its ‘socket’ in the saddle, and drop it at the bottom of the hull in front of you. It takes a couple of seconds, literally. If One-Shot mounts twin 25’s on the back of his 700, will he need 2 joy sticks? Nice picture of the set up. get in the way at all. No taking apart, no putting together – Just ‘plug’ the base into that hole in the saddle, and ‘unplug’ when you no longer need to steer with it. – Supports a 3.5 hp 4 stroke: So it can take you as far as you want to go. Today! – Includes all the features of the W500: Launch anywhere, no wet feet, no wet but, NO BACK PAIN, etc., etc. -And now: REMOTE, INSTANT ON/OFF JOYSTICK STEERING! So, the reason to buy some other small boat would be…………….? You really have done it again. Again! Looks like someone has been playing with pvc Yoav. I’m kicking myself for not figuring this out myself for the 500, so simple. PVC tubes are in the list of over 40 pieces of hardware needed to make this thing work flawlessly. You can alter this design to fit other small boats too, but I’m not sure it would work as well.